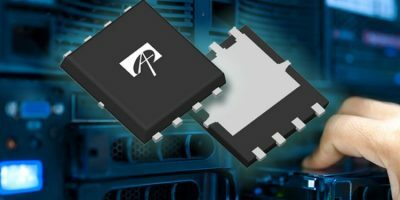 For hot swop applications, Alpha and Omega Semiconductor has unveiled the AONS32100, a MOSFET with low RDS (on) and high safe operating area (SOA) capabilities which are suitable for hot swop and effuse applications. A high SOA is essential in server hot swap applications where the MOSFET needs to be robust to manage the high in-rush current effectively. AONS32100 delivers the best in class robustness for a 25V MOSFET in DFN 5×6, reports Alpha and Omega Semiconductor. The MOSFETs have a maximum RDS (on) of 0.73mOhm at an applied gate source voltage equal to 10VGS. Under the SOA measurement condition of 12V and on for 25ms, the AONS32100 maximum current is 22A which is significantly higher than the previous generation, says Alpha and Omega Semiconductor. High reliability and availability are essential metrics in the server infrastructure, explains Peter H Wilson, marketing director of MOSFET product line. He continued that the hot swop MOSFET is a critical component that must be robust and reliable to meet customer demands, with strong SOA with low on-resistance. The AONS32100 is immediately available in production quantities with a lead-time of 16 weeks. Alpha and Omega Semiconductor (AOS) designs, develops and supplies a broad range of power semiconductors, including Power MOSFET, IGBT, IPM, HVIC, GaN/SiC, power IC and digital power products. The company has developed intellectual property and technical knowledge to introduce products that address the increasingly complex power requirements of advanced electronics. AOS differentiates itself by integrating its discrete and IC semiconductor process technology, product design, and advanced packaging experience to develop high performance power management solutions. AOS’ portfolio of products targets high-volume applications, including portable computers, flat panel TVs, LED lighting, smart phones, battery packs, consumer and industrial motor controls and power supplies for TVs, computers, servers and telecommunications equipment.